While publics around the world are showing signs of apprehension about China’s growing economic power, its role in foreign affairs and the safety of the products it exports, the Chinese are confident that the 2008 Summer Olympics in Beijing will change the way their country is viewed. By nearly unanimous margins, Chinese respondents say their country will be a successful host and that the Olympic Games will help China’s image around the world. Olympic contenders flocking to Beijing from all corners of world will be greeted by a people who currently express extraordinary levels of satisfaction with the way things are going in their country and with their nation’s economy. With more than eight-in-ten having a positive view of both, China ranks number one among 24 countries on both measures in the 2008 survey by the Pew Research Center’s Pew Global Attitudes Project.1 Although levels of personal satisfaction are lower, and by global standards Chinese contentment with family, income and jobs is not especially high, these findings represent a dramatic improvement in national contentment from earlier in the decade when the Chinese people were not nearly as positive about the course of their nation and its economy. In addition to seeing the Beijing Olympics as good for their country, an overwhelming majority of Chinese across all demographic groups say the event is important to them personally. Those who live in the host city are especially likely to say that is the case. There is also broad optimism about the performance of China’s athletes among the Chinese public. Yet, despite the widespread excitement about the Olympics, some in China say their country is paying too much attention to the games, and the percentage who expresses that opinion has increased since Pew Research last asked the question in 2006. The Chinese are enthusiastic about hosting the Summer Olympics. More than nine-in-ten say their country will be successful as a host (96%), including 56% who say it will be very successful. A similar share is convinced that the games, which will take place in August in Beijing, will help China’s image around the world (93%), unchanged from two years ago. The view that China will be a successful Olympics host and that the country’s image will improve as a result is shared by men and women, the young and the old, and the rich and the poor alike. Moreover, those who do not live in Beijing are just as likely as those who live in the host city to say that China will be a successful host (96% vs. 98%). 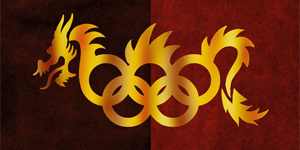 Positive feelings about the Summer Olympics extend beyond the belief that the event will be good for China. Nearly eight-in-ten Chinese (79%) say the Olympics will be important to them personally, while just 17% say it will not be important to them. Solid majorities across all demographic groups say the Olympics impact them personally, but those in the host city are considerably more likely than those in other cities and provinces to express that view. Fully nine-in-ten in Beijing say the Olympics are important to them, compared with 79% in other parts of the country. Opinions about whether the Olympics are important on a personal level also vary somewhat by age, income, and education. Fully 78% of Chinese respondents who are ages 50 or older say the Olympics are important to them, but an even higher percentage of those who are under 30 say that is the case (83%). Among those with low household incomes, three-quarters see the Olympics as important to them personally and 21% say it is not important. By contrast, 87% of Chinese respondents with high incomes say the event is important to them and just 12% say it is not. The Chinese have confidence that their country’s athletes will perform well at the games. Three-quarters say China, which finished third in the medal count, behind the United States and Russia, at the 2004 Summer Olympics in Athens, will win the most medals this summer. Only 15% think the U.S. will take home the most medals. Women are somewhat more likely than men to say China will perform better than any other country. About eight-in-ten women (78%) say their country will win the most medals, compared with 72% of men. Those with less than a high school education, and those in the middle and lower income groups, are also more optimistic about China’s chances. Beijing residents are the least confident that Chinese athletes will outperform their opponents. Fewer than six-in-ten (58%) say China will win the most medals and more than four-in-ten (42%) think the United States will. Outside of the host city, 76% name China and 14% name the U.S. as the country that will take home the most prizes. Overall, more Chinese respondents say people in China are paying the right amount of attention to the Olympics than say they are paying too much or too little attention. But the percentage saying they are paying too much attention has increased since 2006. More than one-in-three Chinese (34%) now say that people in China are paying too much attention to the Olympics; just one-in-four shared that view two years ago. About one-in-five (18%) say the Chinese are not paying enough attention to the games. The opinion that there is too much focus on the Olympics is more prevalent in the host city than in other parts of the country. Beijing residents are nearly evenly split — 46% say people are paying too much attention to the Olympics and 51% say they are paying the right amount of attention. Only 2% in Beijing say that not enough attention is being paid. Outside of Beijing, however, 33% say people are paying too much attention, 19% say they are paying too little attention, and 43% say they are paying the right amount of attention to the games. The survey finds that international opinion largely approves of holding the upcoming 2008 Summer Olympics in China. Majorities in 14 of 23 countries say the decision to hold the games there was a good one. However, European publics are notably less enthusiastic. In France, home to large demonstrations when the Olympic torch passed through the country, a clear 55%-majority calls the decision to hold the games in China a mistake. On balance, the British and Spanish approve of holding the event in China, while Germans, Americans and Poles are more divided on this question. And, unlike in other Asian nations, opposition to the Beijing Games runs high in Japan — 55% of Japanese disapprove of the decision to hold the Olympics there, while just 39% approve. The following sections describe other findings from the 2008 Pew Global Attitudes survey on how nations around the world view China, its policies and its people. For most publics included in the survey, a familiar complaint about American foreign policy — that it tends to be unilateralist — rings true for China as well. The perception that China fails to consider the interests of others when making foreign policy decisions is widespread, particularly in the U.S., Europe, the Middle East and among China’s neighbors South Korea, Japan and Australia. On this and other measures, Japanese attitudes toward China are among the most negative. In addition to anxieties about China’s role in foreign affairs, there is significant concern about China’s growing economy in some countries, especially the U.S. and Western Europe. Even more widespread, however, are worries about the safety of Chinese products. The recent scandals involving recalls of Chinese exports are well known to many, and in most of the nations surveyed, relatively few believe products made in China are as safe as those made elsewhere. In many ways, the survey reflects China’s ascendance as a major power. In both the developing and developed world, people see China having a significant influence in their own countries. In Western Europe, majorities believe either that China has already replaced the U.S. as the world’s leading superpower or that it will at some point replace the U.S. Few Chinese think their country has already supplanted the U.S., but most think it will eventually do so. Majorities in seven of the survey’s 23 nations give China a favorable rating. This is the same number of countries in which majorities rate the United States positively. China’s popularity has declined somewhat since last year in nine of 21 countries where trends are available, while increasing in only two countries and remaining basically stable in 10. American public opinion regarding China is roughly divided between those with a favorable (39%) and those with an unfavorable (42%) view. U.S. attitudes toward China have changed little since 2007, when 42% had a positive and 39% a negative opinion. Ratings for China are decidedly negative in three of the four Western European countries included in the survey. Fewer than one-in-three respondents in Germany, France or Spain express a positive opinion. Moreover, attitudes toward China have grown more negative in all three countries since last year. This is especially true in France, where China’s favorability rating has plummeted from 47% to 28%. This year’s decline continues a slide among Western Europeans over the last few years — since 2005, China’s favorability score has dropped 30 percentage points in France, 26 points in Spain, and 20 points in Germany. And while a plurality in Great Britain continues to express a positive view, opinions of China there are down significantly from 2005, when 65% offered a positive rating. In Asia, opinions about China vary considerably. China is overwhelmingly popular among Pakistanis — roughly three-in-four (76%) express a positive opinion, while just 8% hold a negative view. A clear majority of Indonesians (58%) also have a positive view, although China’s favorability rating has dropped seven percentage points among Indonesians over the last year. On balance, Australians take a positive view of China, while both South Koreans and Indians are divided on this question. On the other hand, the Japanese are more negative than any other public included on the survey — just 14% offer a positive assessment of China, down 15 points from an already low 29% in last year’s survey. Of course, China and Japan have a long and often difficult history with one another, but as recently as 2002 a majority of Japanese (55%) voiced a positive view of their longtime rival. Middle Eastern views of China are mixed. In both Egypt and Lebanon, positive views outweigh negative ones, but in Jordan negative ratings are slightly more common. Similarly, opinions are mixed in Latin America, and many in the region are unable to offer either a positive or negative assessment. More than 70% of both Nigerians and Tanzanians take a positive view of China, but public opinion is quite different in South Africa, where China’s favorability rating is just 37%. Majorities in only nine of the 23 countries surveyed express a favorable view of the Chinese people. Some of the highest ratings come from neighboring countries, including Pakistan (78% favorable), Australia (73%) and Indonesia (59%). Elsewhere in Asia, views are mixed, in South Korea and India, and decidedly negative in Japan, where 73% have an unfavorable opinion, by far the most negative assessment of the Chinese people in the survey. In most countries, views of the Chinese closely resemble views of China as a nation. For instance, this is true in the three African nations included in the survey: Tanzanians and Nigerians have overwhelmingly positive views of the Chinese people, while South Africans lean toward a negative assessment, the same pattern that characterizes opinions of China itself in these countries. In the U.S. and Western Europe, however, there is a gap between perceptions of China and perceptions of its people. This is similar to the gap that characterizes attitudes toward the U.S. and its people throughout much of the world. In Britain, only 47% hold a positive view of China, but 65% have a favorable view of the Chinese people. An even larger gap exists in the U.S., where just 39% express a favorable opinion of China, but 64% express a positive opinion of the Chinese. Smaller, but still substantial, gaps exist in Spain, France and Germany. In most of the countries surveyed, majorities or pluralities think of China as neither a partner nor an enemy of their country. In six nations, the balance of opinion is that China is a partner, while no public included in the study characterizes China as an enemy. This stands in stark contrast to the results from this same question when it was asked about the United States –people are much more likely to label the U.S. as either a partner or an enemy. The way in which people characterize their nation’s relationship with China varies extensively across regions. Pakistanis are especially likely to say China is a partner to their country, as are Nigerians and Tanzanians. A slim majority of South Africans also call China a partner. In neighboring Russia, about half of those surveyed (49%) say China is a partner. Fewer than one-quarter of those in the survey’s five European Union countries — Britain, France, Germany, Poland and Spain — consider China a partner. However, Americans are the least likely to say China is a partner of their country, and fully 20% characterize it as an enemy. China is rated as an enemy by significant minorities in other countries as well, including South Korea (28%), Turkey (25%), Egypt (24%), Japan (23%) and Mexico (22%). Among the publics included in this survey, there is a widely held view that China acts unilaterally in international affairs. Majorities in 14 of 23 countries say that China does not take into account the interests of countries like theirs when making foreign policy decisions. This view is prevalent in the U.S. and among EU nations — more than seven-in-ten in France, Spain and Britain, and somewhat smaller majorities in Poland, the U.S. and Germany, think China generally ignores their interests. Majorities in the Middle East also agree with this perspective. Opinions differ among the six Asian and Pacific countries — Indians, Pakistanis and Indonesians tend to believe China does consider the interests of countries like theirs, while South Koreans, Australians, and Japanese overwhelmingly disagree. Elsewhere, Mexicans and Brazilians are divided on this question, while Argentines tend to think China acts unilaterally. In all three African nations, on the other hand, majorities believe China takes their interests into account. While most of the publics in the survey believe China generally acts unilaterally, the Chinese tend to have a very different impression of their country’s approach to foreign policy. When asked whether China takes into account the interests of other countries when making foreign policy decisions, 83% of Chinese say they believe it does consider other countries a great deal or a fair amount. In 2007, high profile recalls of toys and other Chinese-made products generated considerable media attention in the United States and other countries, and as the results of this poll demonstrate, in many countries there is a high level of awareness about these controversies. With near unanimity (96%), the Japanese say they are aware of the recalls of food and goods manufactured in China over the last year. More than eight-in-ten in both South Korea and the U.S. have also heard a lot or a little about this issue. Awareness is also widespread in Germany (72% a lot or a little), Australia (66%), and Indonesia (66%). And majorities in Nigeria, Britain, Spain, France, Russia and India are familiar with this issue. Few, however, in Latin America know about the recalls — just 27% of Brazilians, 26% of Mexicans and 14% in Argentina have heard something about this. Awareness is also low in Pakistan (17%). The survey finds considerable skepticism about the quality of Chinese products, and this is true even in many countries where awareness of recalls of Chinese projects is low. In 19 of 24 countries, at least half of those surveyed say Chinese products are generally less safe than those produced elsewhere. There is a consensus throughout much of the West that Chinese products are not as safe, although here again, Britain is something of an outlier — just 50% of the British think Chinese projects are inferior to others in terms of safety. Nearly three-in-four Americans equate “Made in China” with safety risks. The South Koreans and Japanese are the least likely to say China’s products are as safe. In both countries roughly nine-in-ten say they are generally less safe than those produced elsewhere. Opinions are quite different, however, in China itself. Overwhelmingly, the Chinese public has confidence in its products — 65% say they are as safe as those from other countries, while just 18% say they are less safe. 1 For more on attitudes toward and within China, as well as opinions on other political, economic and cultural topics, see 24-Nation Pew Global Attitudes Survey, Report 1: Global Economic Gloom – China And India Notable Exceptions, June 12, 2008 and Report 2: The Chinese Celebrate Their Roaring Economy, As They Struggle With Its Costs, July 22, 2008 from both of which this summary is excerpted. 2 The survey in China was conducted from March 17-April 21, 2008, following the onset of civil unrest on Tibet, which began on March 10, and prior to the May 12 earthquake in China’s Sichuan province.